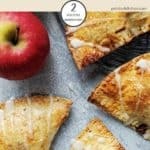 Recipes for Weight Watchers friendly Apple Turnovers have been doing the rounds of WW forums for some time. Some use sandwich thins as the ‘shell’, some use light puff pastry and some use tortilla wraps! But I think the tortilla wrap ones are my favourite. They are sturdy, are less fiddly then using sandwich thins and best of all they are low in SmartPoints. Plus you get a lot of turnover for your points and that has got to be a good thing … hasn’t it! The tortillas are filled with a sweet apple & cinnamon filling, are brushed with an egg wash & baked till golden and crispy. OK, so what’s not to like! Place the chopped apple into a small saucepan and add the cinnamon, nutmeg, cornflour and sweetener (picture 2), stir to coat the apple pieces then add the water. Cook over a medium heat, stirring often, until the apples have slightly softened and are coated in a thickish cinnamon syrup (picture 3). I like to mash about half of the apple mixture with a fork and leave the other half chunky! That gives the turnovers texture. Halve the tortillas by cutting with a sharp knife (picture 4). You will have 8 semicircles of tortilla. Brush the inside edge of the tortilla semicircle with egg (picture 5). 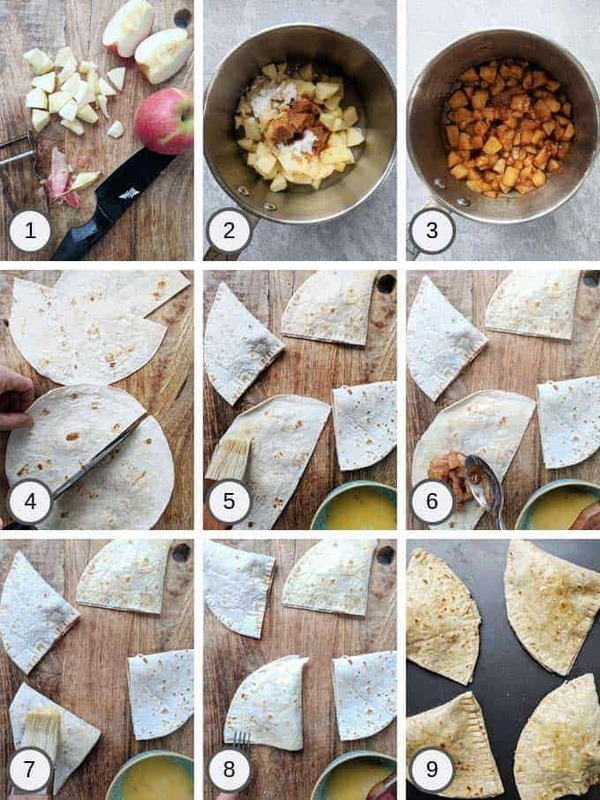 Place a dessert spoon of the apple mixture on one half of the tortilla (picture 6). Don’t be tempted to overfill as the filling will leak out when baking. Fold the tortilla so that the apple is encased and brush with egg wash (picture 7). Seal around the edges by pressing hard with a fork. The egg wash around the inside of the turnover will help with sealing the two bits together. Place on a non stick baking tray (picture 9) & bake in the oven for 10 – 12 minutes or until golden brown. Remove from the oven and place on a wire rack to cool before drizzling with the glaze. Be careful when making the glaze not to use too much water. Place the icing sugar / powdered sugar into a small bowl and add 1/4 teaspoon of water to start off. Add a little more bit by bit till you get the right consistency. I don’t like Sweetener! Can I use sugar instead? If you don’t like using sweetener, you can swap it for 2 level teaspoons of sugar instead. This increases the point value slightly – 1 Apple Turnover would be 3 SmartPoints and 2 Apple Turnovers would be 5 SmartPoints. 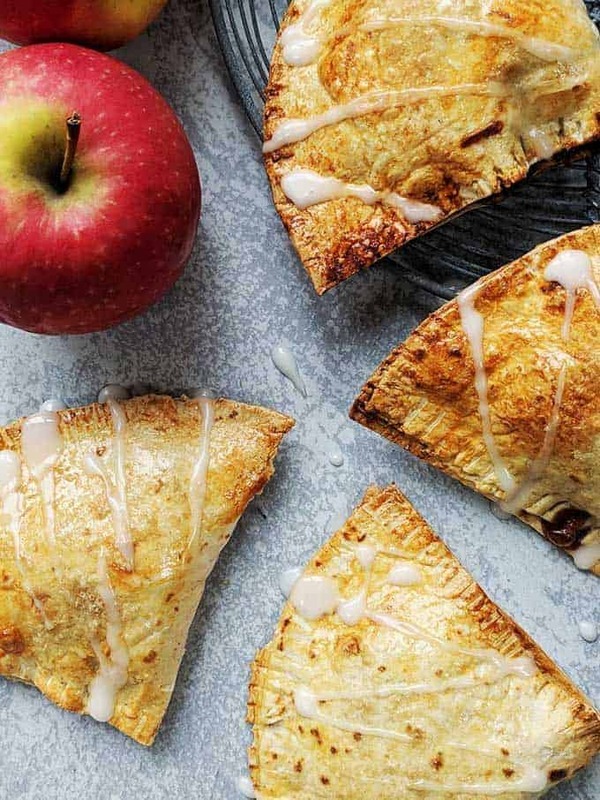 Use a sweet variety of apple to make these Apple Turnovers. That way you can get away with using less sweetener than if you use sharper tasting apple varieties. 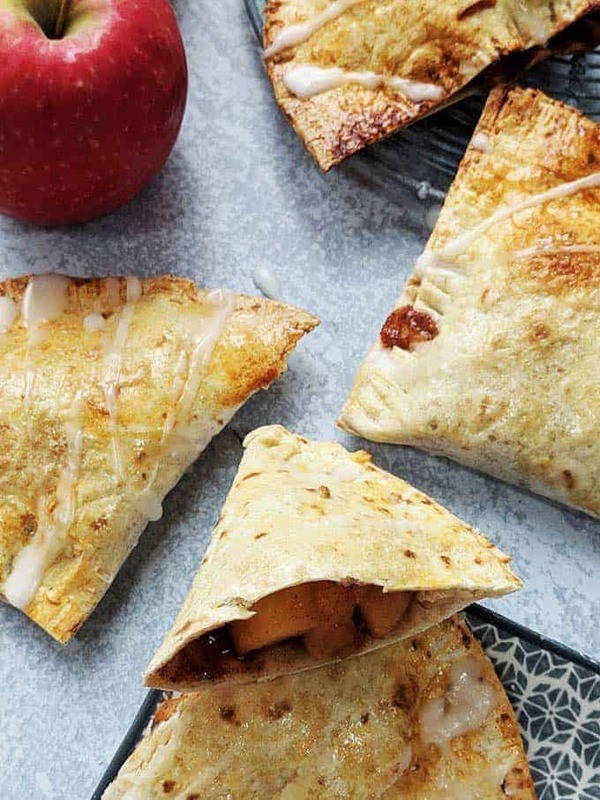 Which wraps are best for making these Apple Turnovers. I used WW White Wraps. They are 3 SmartPoints per wrap. The 4 wraps that were used in this recipe, worked out as 14 SmartPoints in total. Sainsbury’s be Good to Yourself Tortilla Wraps work out at 15 SmartPoints for 4 wraps – meaning that each turnover would be 2 SmartPoints and two turnovers would be 5 SmartPoints. If you use other brand wraps just beware that the SmartPoints can vary widely! For example Tesco White Tortilla Wraps work out at 22 SmartPoints for 4 (meaning that one Turnover would be 3 SmartPoint and two Turnovers would be 7 SmartPoints). If you are in the US, there are a number of 1 SmartPoint wraps including the Extreme Wellness Wraps & Mama Lupes brands, both of which are available to buy as multipacks from Amazon. Using these brands reduce the SmartPoint value of these Apple Turnovers to 1 SmartPoint for one and 3 SmartPoints for two! Omit the icing sugar glaze and use 3 teaspoons of demerara sugar instead to sprinkle over the top of the turnovers for a bit of sweet crunch. Mix 1 – 2 teaspoons of pumpkin spice into the apples rather than using cinnamon and nutmeg. Swap the cinnamon and nutmeg for your favourite apple pie seasoning mix. Looking for more WW Dessert Recipes? If, like me, you love dessert you may also be interested in this 7 SmartPoint Apple Cake or these 4 SmartPoint Banana Muffins with Streusel Topping. These Pumpkin Spiced Scones are very popular and are 7 SmartPoint per generous piece! I have found that these Apple Turnovers keep in an airtight container for a couple of days. However, they do go a little soggy. Just pop them back in a warm oven for 5 – 6 minutes to crisp up and warm through before serving. It is probably best to store them prior to putting the glaze on, but it’s not vital as long as you’re not bothered about how they look as they still taste delicious! 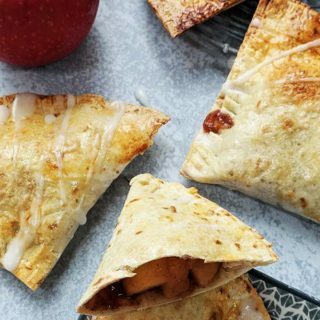 These wonderfully tasty & easy Apple Turnovers are 2 SmartPoints or 5 SmartPoints for 2. Peel, quarter and core the apples. Chop into small pieces and place in a small saucepan along with the cinnamon, nutmeg, sweetener, corn starch and stir. Add the water and heat over a medium heat, stirring every now and again, until the apples have softened. This will probably take between 10 - 15 minutes but is entirely dependant on the kind of apple that you use. If you need to add a few more tablespoons of water to the mix, do so but don't overdo it as you don't want the apple filling to be too runny. Once the apples have softened, use the back of a fork to mash about half of the apple into a puree. I prefer to leave some chunks as this gives the turnovers more texture. For photo instructions of constructing the turnover, see the post above. Lay out the tortilla wraps and cut in half so that you have 8 semicircles. Brush a bit of the egg wash around the edge of the tortilla before placing a spoonful of the apple mixture at the bottom of the semicircle. Fold the tortilla wrap over, brush the top of the turnover with egg and use a fork to press down around the edge to seal. Place on a non stick baking tray and bake for 10 - 12 minutes or until golden brown. Remove from the oven and place on a wire rack to cool. Whilst they are cooling, place the icing sugar / powdered sugar in a small bowl, add a little water (1/2 teaspoon) and mix to form a glaze that can be drizzled over the top of the turnovers. If you want to store them, it's best to do so before adding the glaze (although not necessary). The turnovers can be kept in an airtight container for a couple of days - they will become a bit soggy but can be warmed in an oven for 5 minutes to crisp up again.